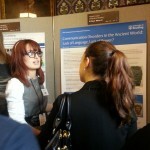 Abi Cousins, a current finalist in our department, recently won at the 2013 Reading Undergraduate Research Opportunities Programme (UROP) showcase event with a poster that displayed the main findings of her UROP project ‘Communication Disorders in the Ancient World: Lack of Language, Lack of Power?’. 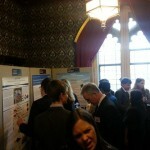 The project was carried out under the supervision of Prof. Peter Kruschwitz, and since then it has resulted in a preliminary publication of their findings in the JACT journal Omnibus. 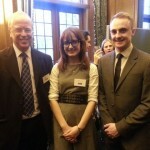 In recognition of Abi’s excellent achievements, the University of Reading gave her the opportunity to present her research at the 2014 Posters in Parliament event in London on 25 February, organised by the University of Central Lancashire and the British Conference of Undergraduate Research. 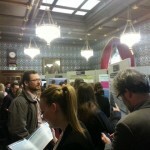 In an overall heavily science-dominated setting, Abi’s poster – the only submission in the area of Classics from the entire UK and one of the very few posters based on Arts-and-Humanities-related projects – attracted significant attention: even after an hour and a half of answering questions (in what was planned to be a one-hour slot), Abi still found herself answering questions and offering offprints of her co-authored article. 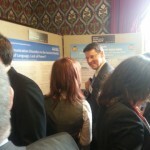 …at the busy Posters in Parliament event.